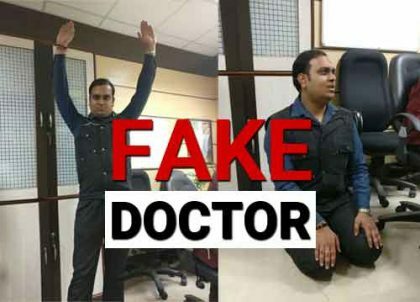 New Delhi: Days after an impostor, portraying himself as an Associate Professor at AIIMS was arrested from the orthopedic emergency of Safdarjung Hospital, doctors at AIIMS have nabbed another fake doctor from the AIIMS campus itself. This time, the impostor, identified as one Ritaj Tripathi was caught after he was trying to arrange an admission for a patient.Ironically, this impostor, like the previous one has also been revealed to be a Yoga Graduate. In the complaint filed with the police station, AIIMS authorities have alleged that he was running an illegal business of making money from patients by getting them admissions. His confession stated that he had visited AIIMS, New Delhi on a number of occasions earlier also and is introduced himself as a doctor. On being asked why he conned patients and if he had actual medical knowledge, he said that he is not a medical doctor but he is a yoga graduate from Morarji Tripathi National Institute of Yoga, New Delhi. Considering the similarity of situations of the impostors being caught, practitioners at AIIMS are suspecting a nexus of a gang that seems to be operating in the huge campus of the prestigious medical college.